Photo by Cathy WebbParkwise is the parking management system in Downtown Albany, Oregon. 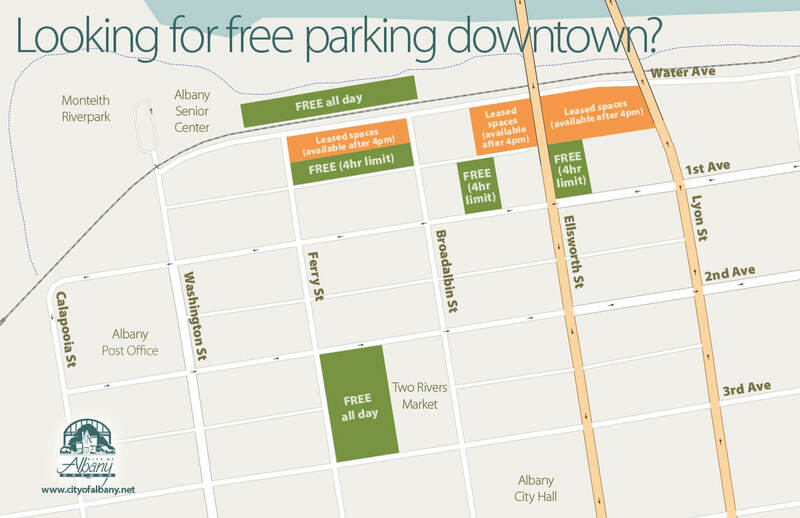 ParkWise is a downtown parking management program operated under the umbrella of the Albany Downtown Association. We contract with the City of Albany to enforce parking zones within the Downtown area to ensure there is plentiful customer parking. There are several options for parking in Downtown that vary depending on whether you are a customer, employee or resident. We provide four large public parking lots for customer convenience as well as on-street parking. You can view the color-coded map to see the different zones within Downtown. Listed below are the parking options. There are several options for parking in downtown that vary depending on whether you are a customer, employee or resident. We provide four large public parking lots for customer convenience as well as on street parking. You can view the color-coded map to see the different zones within downtown. Listed below are the parking options. Customers may park free in any zone in downtown except lease lots. Look for signs on the street to determine time zones. Parking times zones are: All Day Customer, 4-Hour Customer, 3-Hour Customer, 30-Minute and 10-Minute. Not every space is marked, so use common sense to determine how on-street spaces are zoned. These are designed for employees who are frequently in and out of the office and or constantly loading and unloading supplies and need close access to their place of employment more than 5 times per month. These permits are available at the discretion of the ParkWise Policy Board and cost $50 per month. These are for employee on street parking in designated areas only. They are on a first come first served basis and cost $25 per month. No particular space can be reserved for permit holders. These have the same guidelines as employee permits, but are available for just $5 a month with proof of residency in a legal residential dwelling. These are located in lots between 1st Avenue and Water Street. They are reserved for the individual leasing a particular space number. Lease spaces provide the only guaranteed parking in downtown for employees. The cost is $20 per month. This lot is located on Water Street between Broadalbin and Ferry Streets. It is an all day lot for any employee, resident or visitor who wants a free place to park legally within the patrolled area of downtown. These are available on a day-by-day basis for occasional use. These permits allow employees and others to access 3 & 4-hour customer only parking for the entire day. They can be used for long-term loading and unloading, temporary injuries, temporary employees or other valid reasons that require you to park close to your place of employment. There is a limit of 5 Daily Permits per month to each individual. Daily permits are not valid in lease spaces. These are available to free to contractors working within the Downtown enforcement boundary and are available in person at the ParkWise office. Contractor permits are not valid in lease spaces.